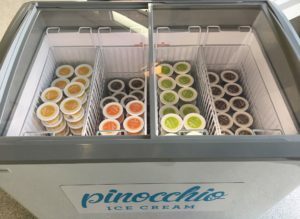 Pinocchio Ice Cream offers wholesale for restaurants, cafes, and other food service establishments. Or perhaps you’re planning a celebration at your wedding, office, or school? Single Serve pre-filled cups with spoons. Free freezer rental locally with orders over 250 cups. Deliveries are made Monday thru Friday, within the Edmonton area. Please email info(at)pinocchioicecream.ca for further details on wholesale options, or to begin your order.